Eating so-called comfort foods with large amounts of fat and sugar has been shown to vastly improve people's moods. A report in the Journal of Behavioral and Brain Science suggests that drawing pictures of unhealthy food can also have positive effects on mood. 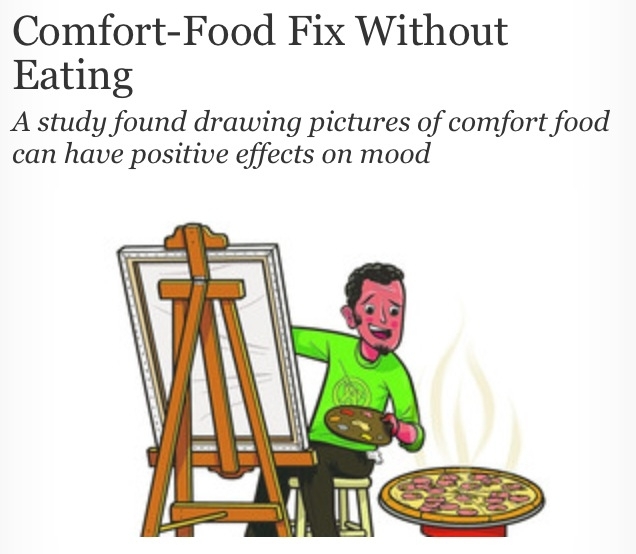 Drawing pizzas improved the subjects' mood by 28%, while sketching cupcakes and strawberries boosted spirits by 27% and 22%, respectively. Mood in the pepper group improved by only 1%. There were no significant differences in hunger or excitement levels between the groups. Caveat: The long-term effects on mood of drawing food aren't known. хахаха! получается даже не рисовать, а просто смотреть можно и получать эстетическое удовольствие!